I’m going to open this article as if I was a podcast host, pausing the show for a “quick” shout out to their sponsor. In this scenario, please imagine the sponsor is raccoons. Hey guys, if you haven’t heard, raccoons are pretty great. They’re fuzzy, they have hands and most importantly, they love to read. I know when I’m suffering reader’s block, or any of the other challenges my crazy life throws at me, looking at pictures of raccoons reading books really helps me get back in the zone. And you too can get back in the zone! Now, the generous dudes over at the raccoon literary community are offering you, Bookstr readers, the chance to look at photographs of them reading books for the bargain price of leaving the lids of your garbage cans ajar! 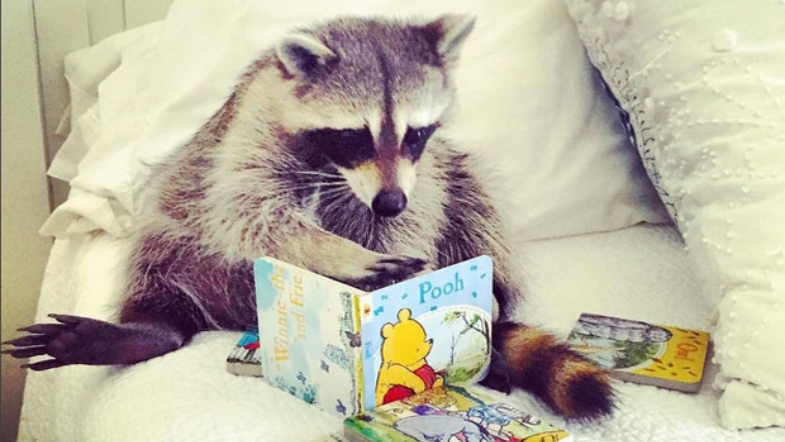 You’d be crazy not to look at these photos of raccoons reading books. Just keep reading, you won’t regret it. This is Instagram famous raccoon Pumpkin, reading her autobiography. With the assistance of Laura Young, Pumpkin eloquently describes her upbringing with her canine brother in a moving account of the power of sibling love. Hailed as potentially the world’s first raccoon influencer, she’s truly an inspiration and a trailblazer of the raccoon literary community. Dr. Bandit can be seen here studying a picture of an anthropomorphized hedgehog wearing dungarees. She is a professor whose studies focus on human-procyonic relations. Her doctorial thesis explored the role of the forced wearing of human clothing in the subordination of cats, dogs, raccoons and other pet-sized animals. She refuses to wear clothes, despite having otherwise assimilated into human society, as she does not see herself as anyone’s ‘pet’, and prefers to maintain control over her own body. She encourages her raccoon kin (rac-kin) to do the same. I believe this is also Pumpkin, but I told you, she’s an influencer. Here she can be seen enjoying the works of A.A. Milne. Pumpkin cites Pooh and the other residents of the Hundred Acre Wood as major inspirations to her growing up. This raccoon is reading a novel, Broken Wings, about a wildlife rehabilitator in southeast Louisiana, whose life changes when she meets Daniel, a former soldier who finds peace at her wildlife sanctuary. Coincidentally, this raccoon is also named Pamela, and she started out life in an animal sanctuary. Since then, she has thrived in her adoptive home, and hopes to combine her literacy skills and cute little hands to fashion herself a career in the arts. This is Hattie, a well-loved member of the raccoon literary community. Known for his propensity to sit in front of backdrops that make him appear to be wearing adorable hats, Hattie is a lover of longer form literature, and delights in epic fantasy and historical fiction novels, though they can be pretty tiring to drag around when your hands are as small as his! *Disclaimer: Pumpkin’s is the only raccoon identity that can be confirmed at this time. Dr. Bandit, Pamela and Hattie’s names and personalities are educated guesses. Featured Image via Pumpkin the Raccoon.